When I first heard about being a “Blackheathen”, I thought it sounded like joining a Satanic cult. 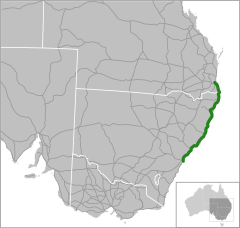 However, Blackheath is actually a town in the Blue Mountains West of Sydney and the locals call themselves “Blackheathens”, while throughout it’s history, visitors have dubbed it: “Bleakheath”. It is freezing. Well, at least by more wimpy standards where 18°C is considered “frozen” and we’re wrapped up in so many layers of jumpers, blankets, coats and overcoats, that we look more rugged up than Eskimos. Last week, I loaded up the little red car and drove up to Blackheath to stay with a cousin for four days. This was no ordinary “cousin” either. My 4 x Great Grandfather, John Johnston was her Great Grandfather’s older brother. We first met about 20 years ago when I was researching the bridge they built, the North Sydney Suspension Bridge, and I came across her name in a newspaper article in the local history file at the library. We met up back them, along with another cousin who was in her 80s at the time, and we formed a sort of inner circle of this vast outer circle of this Johnston family hailing back to the island of Islay in the Scottish Hebrides. Angus Rutherford Johnston my 4th Great Uncle and James Campbell in Seattle, USA. The photo album itself was a work of art. When I got back in touch a few weeks ago, it turned out that a cousin had dropped off two family photo albums dating back to the 1880s and she invited to to come up to stay, copy of the photos and catch up. As it turned out, copying the photos was the tip of the iceberg and I was brought deep into the Blackheath fold and not only taken to local lookouts, but also inside Blackheath. I watched a local musical theatre production on DVD called something along the lines of: “A Hot Time in Blackheath”. Blackheath used to be a popular destination for not only honeymoons back in the day, but also a “dirty weekend”. As I’d toured the lookouts in the past, such history had never crossed my mind. So, it was quite interesting to get this inside perspective. Zooming in on a rock face over Govett’s Leap. I have always been astounded by the tenacity of Australian plants to grow in such challenging locations. Before I left for Blackheath, I had been planning to indulge in food the entire week without any thought of ballooning into twice my size or blowing the budget. I was wanted to indulge. However, while we did stop at the Ivanhoe Pub for a magnificent pie, I actually indulged more in books as I found out that one of my favourite all time bookshops, Gleebooks, had a store in Blackheath and I fell deep down that precarious slippery slope back into book addiction. Meanwhile, in the nearby carpark, I spotted an amazing mural designed by Jenny Kee, a well known Australian fashion and event designer and writer and Blackheath local on the side of the historic Victory Theatre. The mural features bold and colourful representations of Australian plants and wildlife in Jenny Kee’s typical style. Of course, my time in Blackheath was over way too soon. However, I did spend a few hours in Katoomba, breaking the homeward journey. So, stay tuned. Have you ever been to Blackheath? This entry was posted in Australia, Photography, Travel and tagged Australia, Blackheath, Blackheathens, Bleakheath, Blue Mountains, family, family history, holiday, holidays, Johnston, travel, vacation on July 15, 2018 by Rowena. Now that I have pulled off my Great Downhill Challenge, it might appear easy, achievable, a fait accompli which was never in doubt. That is the great value of hindsight. 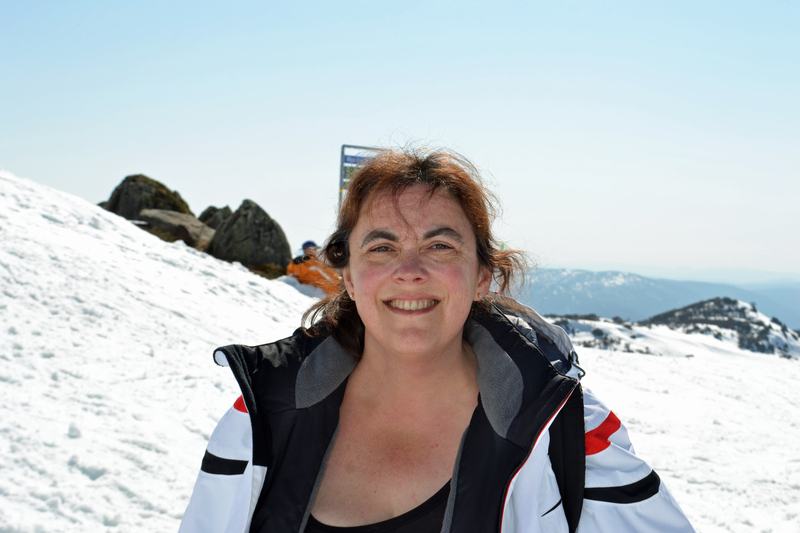 Until I had actually skied down the Front Valley at Perisher, even I had my doubts. I was optimistic, hopeful and had put in the hard yards. Yet, the great unknown was still hovering over my hopes like an omnipresent raincloud threatening to burst. All I could do was have a go and do my best. I booked myself into a private, adaptive ski lesson and really didn’t know how things would pan out. Far from being the all conquering hero, I was 100% chicken wobbling on my skis gritting my teeth, holding my breath and staring at my feet. Thank goodness I had my instructor Tom to guide my path. That made all the difference. My other life- having my transfusion of IVIG. It’s actually quite relaxing. Skiing isn’t an easy sport for anyone and perhaps not a good choice for someone in my situation. 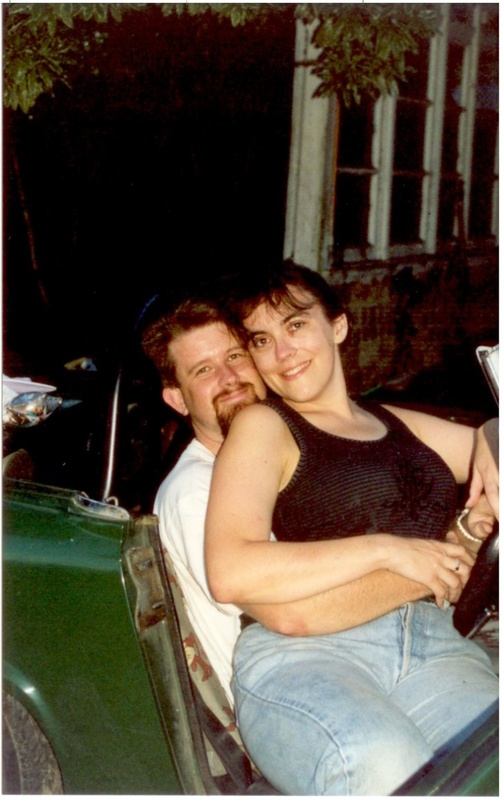 I was diagnosed with hydrocephalus (excess fluid in the brain) in my twenties. I had brain surgery and had a shunt inserted which largely manages this condition, although I still have some residual symptoms. I also have a serious life-threatening auto-immune disease called Dermatomyositis (DM) which seriously affects my muscles, lungs, skin and digestive tract. I developed DM after my second pregnancy at age 35 and had experienced no prior symptoms. I literally take a dozen tablets every day to manage DM, in addition to having blood transfusions of immunoglobulin every 3 weeks. My DM is considered severe and fairly unstable. My mobility and energy levels fluctuate greatly even within a given day. Most days I have a 1-2 hour nap to get me through the day and I usually wake up feeling like a lump of stone. I can barely move. Obviously, my medical situation turns any kind of skiing into a fairly significant challenge. 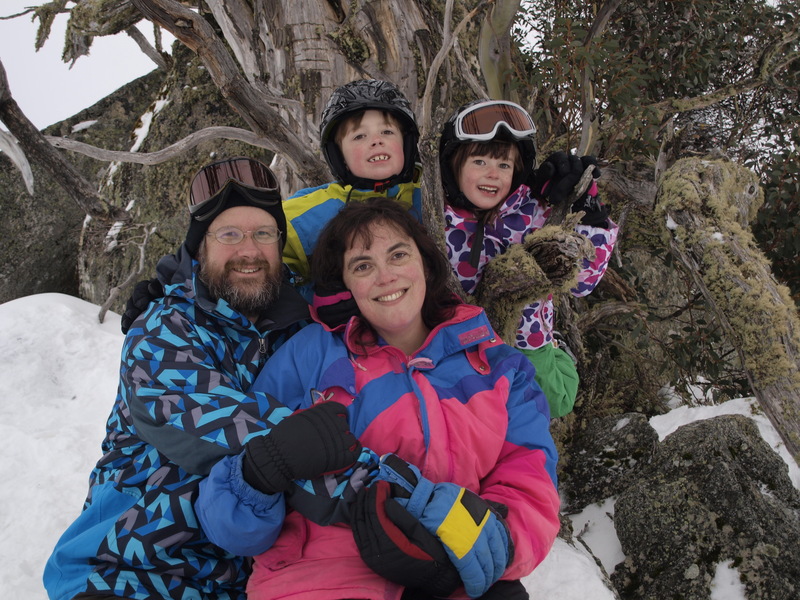 In June 2012, our family went to the snow using Flexirest funding. My husband Geoff and our children Jonathon and Amelia all went skiing while I stayed down below doing my writing and photography. I was enjoying the view but at the same time, I was pretty upset about not being able to ski with the rest of the family. Moreover, I’d really enjoyed MDNSW’s Adventure Camp at Nelson Bay and now found that I now enjoyed outdoor challenges and wanted to be a part of the action as well. I did do a bit of half-hearted research into skiing for people with disabilities but couldn’t find anything. Meanwhile, the afternoon before we were to leave on our big skiing adventure, the pathology lab rang me directly at home to tell me to go straight to Emergency. They thought I was having a heart attack. My CK levels were also up. Yet again, my life flashed in front of me. We hoped that the DM flare was responsible for the blood test results in which case there was no heart attack but we still had to go through Emergency. As you would appreciate, you never know how long that will take and there was also the usual concern about being admitted. Hospital was the last place I wanted to be. 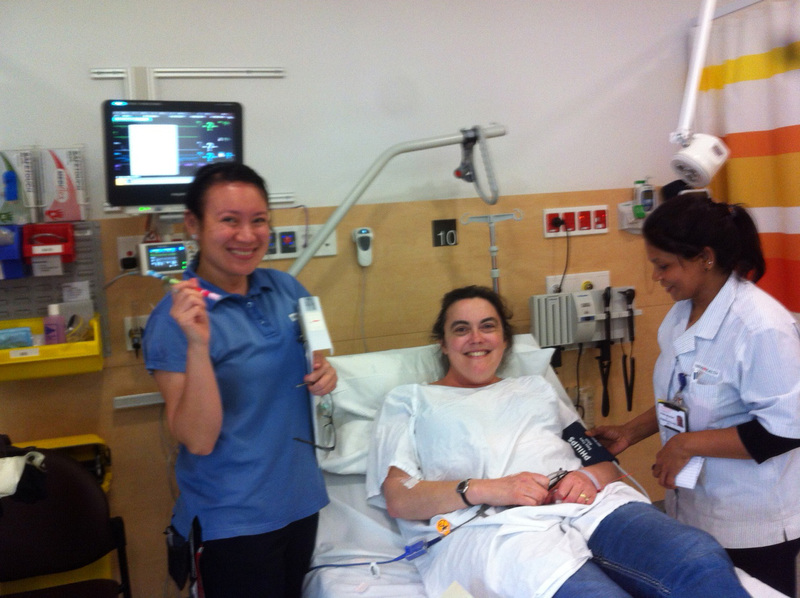 Fortunately, three hours later, we were given the all clear and we were still off to Perisher but my DM was back and my prednisone was also on its way up again…a double whammy! Family Portrait 2012- I had serious breathing troubles climbing up the hill. Almost as soon as we arrived at Perisher, we spotted the Paralympics ski team zooming down the slopes. They put me in touch with the Disabled Winter Sports Association (DWA). I heard that they had special equipment which could get me down the mountain. The Great Downhill Challenge was born. Instead of trying to climb up the mountain, I would ski down. It all seemed so much easier and I pictured the four of us smiling away as we skied straight down the Perisher’s Front Valley holding hands. That “vision” shows just how much I was dreaming. That’s not how you ski down a mountain, especially as a beginner. As time went by, I also realised that when you draw a mountain and turn it around, you get a smile. You can even add some eyes and you have a smiley face! I loved that. However, I came to find out that turning a mountain around is much, much easier on paper than it is in the real world. Those mountains have been mountains for a very long time and weren’t designed to be moved at least by me. Initially, I had intended to do the Great Downhill Challenge as a fundraiser but realised that skiing itself was going to be challenging enough. I also thought it would be better to try skiing first before I committed myself to any great feats of heroism. Moreover, a friend of mine had pointed out that if I staged a down the mountain event, then I’d actually have to go down the mountain. It was only when I stood at the top of Front Valley gazing over the edge in horror, that I understood what that really meant. It was a very, very long way down and I was absolutely terrified. I was quite relieved that I didn’t have that extra pressure. My first time up the magic carpet Perisher with my instructor. Membership with the DWA entitled me to 50% off my lift pass and ski lessons. I wasn’t quite sure what equipment I would need and in the end we agreed that I would try a private adaptive ski lesson without equipment to see how I went. My instructor was the wonderful Tom Hodges from Perisher Ski School, who also volunteers for DWA. 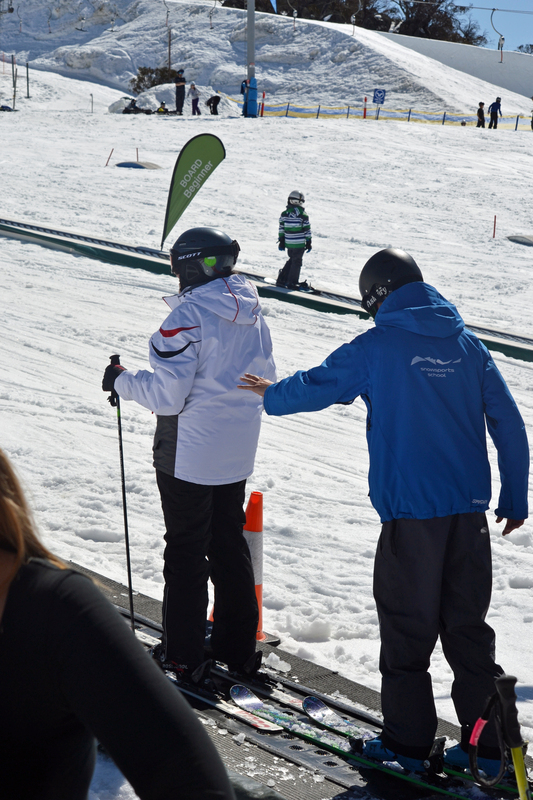 He has had a lot of experience teaching people with a wide range of disabilities to ski using a range of equipment. I thought I might be needing a sit chair but no. I was out on two skis and Tom who doubled as my anchor. We started off going up the magic carpet and then gently snowploughed down the slope (it was a huge hill to me at this point but in reality it is almost flat!) Tom told me to breathe. Look up and enjoy the scenery. Apparently, I was staring at my boots, holding my breath and gritting my teeth the whole way down. Gradually, my fear eased and by the end of the lesson, I was feeling quite exhilarated and was almost having fun. Day 2 proved much more challenging. Tom with his big ideas suggested we take the chairlift up the top of Front Valley. I was keen enough. I trusted Tom and ignorance was bliss. I didn’t quite realise we were going that far up and the mountain looked very different close up especially when I was about to ski down. I was absolutely terrified, consumed by fear!!! It was such a long, long way down. I felt like I was perched on the edge of the world about to plunge to my death. That said, Tom was very encouraging and saw strength in me which I couldn’t sense in myself. He reminded me that I just needed to do my snowploughs and turns like I’d been doing down below and I’d be fine. I fell on a tricky part at the start and Tom held my hands for a bit until I found my footing and gradually let me go. Skiing down the mountain was much, much harder than I’d ever imagined. Rather than skiing straight down the mountain, I needed to snowplough and then put all my weight on my downhill leg to turn. This took quite a lot of force and I was needing to trust my “jelly” legs which have let me down in much more humble situations. That in itself was scary. Yet, Tom had faith in me and besides, I wasn’t going down the mountain alone. I had expert help where I was encouraged to do what I could for myself but with a safety net when I struggled. Struggle I did. My legs were sore and I was really straining to breathe. I had to stop a few times to rest, catch my breath and take some Ventolin. Apparently, I was holding my breath and clenching my teeth and my whole body was twisted and contorted by fear. Going down the mountain was so much harder than I’d thought but I was doing it. At least, that felt good! I was certainly no picture of success but that’s what it takes to catch your dreams and finally make them real. You have to push yourself well and truly beyond your comfort zone or there is no challenge. Somehow, I actually skied down the mountain and survived. I’d done it! I’d turned my mountain around but would I tackle the mountain again? Could I go back? I still had 3 days to go. That was my second challenge and at this point, I hadn’t skied with the rest of the family yet either. 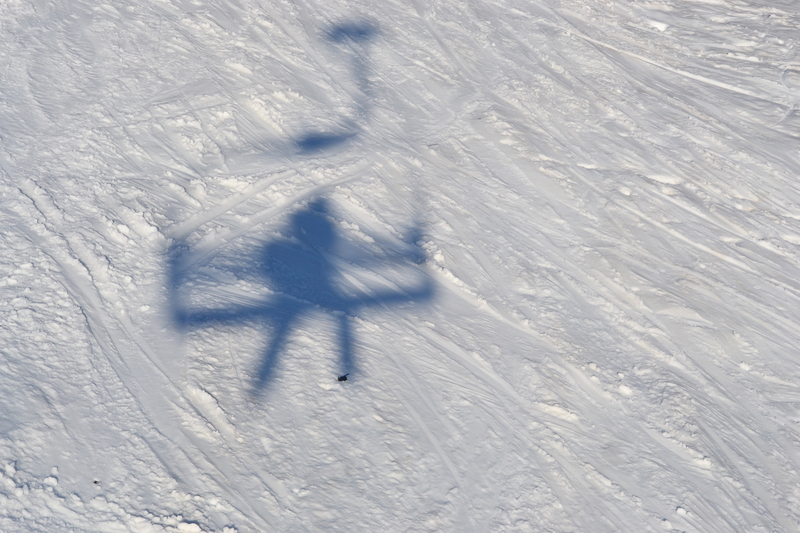 That was really the most important part of my goal…for us all to ski together. That was getting harder because the kids were no longer beginners and they were rocketing down the slopes after ski school with Geoff. They were proud of me but I was way too slow. The next morning was a bit of a turning point. 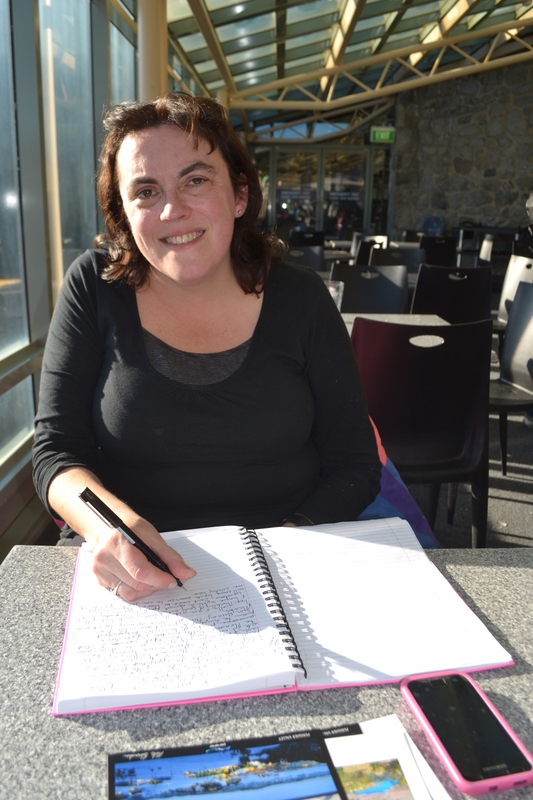 I had a nasty chest infection threatening to put me out of action. I scoffed down some olive leaf extract to fight it off and used my puffer. I wasn’t going to let a cold hold me back. We had one week at the snow. I could collapse when we got home. I was sitting on the chairlift heading up to mid-station for my morning hot chocolate with cream and marshmallows when I experienced such pure peace, serenity and weightlessness. It was like an out of body experience where all the heaviness of my tired limbs and heavy ski boots were gone and I was just floating along like a bird freed from all restraint. Feeling so unbelievably good and that liberated, I considered spending the rest of the holiday just going up and down the chairlift instead of skiing. Take the easy way out. Why push myself when I could just relaxed and have fun? However, I remembered my battle with the violin and how it took time and a lot of practice to get over that beginners hump before I could actually enjoy playing. It takes 10,000 hours of practice to succeed so how could I possibly expect to ski like a pro after just two hours? I decided to spend more time practicing where I was comfortable on the carpet before I tackled the mountain again. I practiced, practiced and practiced and by day 5 on Friday, I again felt able to take on the mountain, although this time we went halfway and did it twice. Geoff joined us the second time round and Tom did a great job capturing the moment on the Go Pro. For once, I wasn’t behind the camera. I still had my L plates on and my instructor in tow but I had become a skier. Me with jelly legs, dodgy lungs and a shunt in my head had actually conquered the mountain or at least a small part of it. Awesome! At 4.58 pm Friday afternoon, just minutes before the magic carpet was closing on our last day, the four of us finally skied down the magic carpet together. We weren’t holding hands but the kids and Geoff were following my lead and we finally skied down the mountain together all smiles! Together, we had turned the mountain around! PS You can beat one mountain but you can be sure that another mountain is just lurking round the corner. This year, I waited until we arrived home before I had my blood tests. Wise move. My Professor just called. The dermatomyositis is on the march again. CK reading of 423. Not too bad but heading the wrong direction. Let’s hope I start going down this mountain again soon! This entry was posted in Health, Parenting, Skiing, Travel, Uncategorized and tagged Australia, challenge, chronic illness, dermalomyositis, disability, Disabled Winter Sports, family, holiday, Jindabyne, mom, mountain, mum, myositis, parenting, Perisher, skiing, snow, vacation on September 11, 2013 by Rowena.